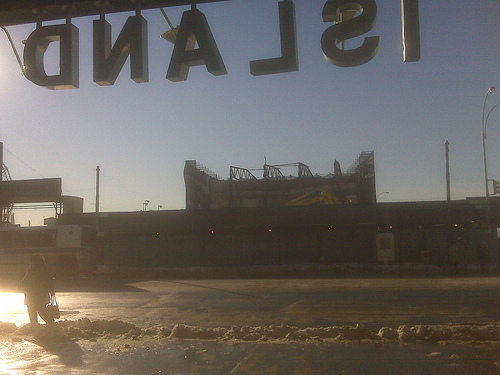 The view as you come out of Stillwell Terminal beneath the letters that spell Coney Island is rapidly changing. Earlier today, Anonymous Poet sent us this striking image of the Henderson demolition along with the message: “I was awed by the almost art nouveauy beauty of those big metal supports.” The Bowery side of the building is all that remains of the once grand and soon-to-be-gone Henderson Music Hall. Funny, I was a few miles away liking the view from King’s Hwy.